This is another photo I'm considering having made into note cards. Opinions? It would make a great notecard! I think it would also look very stunning to do some work with it in Photoshop...sorta take the pink flower and put it against a black background. I think it would make it sorta modern-ish. Definitely dramatic. Beautiful. That would make an awesome note card. Love the color. 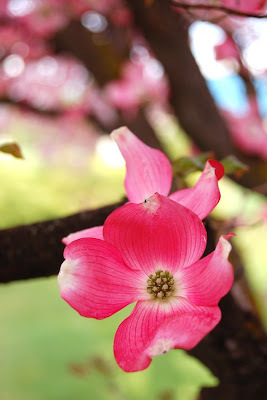 Oh dogwoods always remind me of summer in the South! I agree,it would make a great card :) I think you could leave it as is, but in photoshop it would do well too! Very nice, I approve this note card choice! Definitely deserving to be made into a notecard! This is a very beautiful capture!